Well, here we are in paradise! Hours and hours of travel, three airports and all sorts of smells that I don’t normally smell. Mostly coming from me. Did you know that there are no more meals on planes unless you purchase them? Yeah, I knew that too. However did you know that not only don’t you get the crap TV after 45 minutes but the only movies are ones that you purchase from a selection of four. Oh, I could have actually listened to the lady sitting next to me, but I found that if I would just smile and nod I could still sort of read. We did sit on Waikiki Beach for a few hours and managed to get my feet wet and sandy. I did get a little too muchsun, but the doctors say that I can get back on the beach in two and a half to three weeks. I plan on trying to stay awake long enough to get my body in sync with the local time. The weather is great and everything looks to be perfect. How is the snow???? Oh yeah Brian Vancouver Airport is quite the hike. Well, seats are booked, bags are packed, timers are set and I am as knotted up as a rope at a Boy Scout jamboree. I’m not sure why I get so distressed about travel? I love getting on the plane and seeing just how three overweight people can wedge themselves into those tiny seats without being touched in a less than meaningful way. I love being in different places and talking to strange people about their odd habits. Perhaps that is why I get a less than stellar reception. I love trying new foods, well as long as there is no spice and it doesn’t look or taste weird. It is great shopping at local stores like Wal-Mart, Safeway, 711, Sears, etc. I don’t know, maybe I was born a two centuries too late. Can you imagine that instead of walking down a hallway and sitting in a tube with 200 or so strangers for 5 hours and then walking down another tube and being in a foreign country; instead you walk up a ramp and spend three months puking your guts out eating stale biscuits and brackish water only to arrive at your destination and find out that the locals need a sacrifice to their Gods. Hmmmmm…maybe I was born a century or two too early. My brother called to warn me about the feral pigs of Hawaii. I told him that if anything is going to be eating, it will be me and not the pigs. We just dropped Buster off at Arwen and Chris’s place. I hope that he has a good time. I bribed my grandson to look after him and hopefully he will stay bought for the entire time we are away. I’m sure there is something else that needs looking after, so off I go. Well, one and a half days till we leave for paradise. I am getting or should I say trying to get things ready for the suitcase. The suitcase is a harsh mistress! I know that I am taking too much of everything and most likely inappropriate things at that. 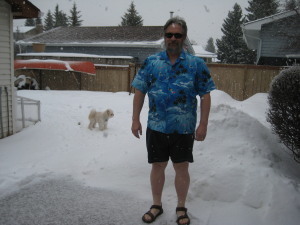 Calgary shorts and Hawaiian shorts are not the same. Sort of like women and men are the same yet not alike at all. Calgary shorts are of heavy weight fabric and are really bordering on being lined for those days you are caught out in a short snow squall in August. Hawaiian custom dictates grass skirts. No one wants to see me in a grass skirt. Who knows what might pop up and surprise you when wearing one of those. The most challenging thing seems to be what cables go with which device? Get that wrong and you have lugged an expensive rock half way round the world. They all look alike! Let's not even talk about finding the right books to take to expand my mind and broaden my horizons. I don't travel well! Like some wines there is a very good chance that I will be sour by the time I arrive. Oh, I know it will all be good, but my tendency is to over think everything. Expect the best and plan for the worst. I am just thankful that I am not Louise and don't have to travel with me. When do you think we should start calling her Saint Louise? I guess I had best get back to my cables and shorts. That sounds dirty but it isn't. The to do list seems to be getting longer instead of shorter. If only there were stores in Hawaii where you could pick up the things that you forgot? Oh well, what is that saying, " If wishes were fishes we wouldn't have nearly enough tartar sauce." I have no idea what that means, but I am craving something deep fried right about now. Well, I've finally got all those potatoes put away that Ken had lined up in series to power up the computer last night. Hopefully the holes will 'heal up' and the potatoes will keep - 150 potatoes?!?!?! - what was he thinking? I celebrated Earth Day getting paperwork organized and post-dating bill payments to make sure everything is taken care of while we're away. I pretty much had my packing plan and on a whim decided to email my coach for her advice on paddling clothing. While that was a good thing to do, it has thrown my plan out of whack and I now have 3 days to pull things together. I was planning on wearing tank tops but she suggested long sleeve shirts to minimize sun damage from being on the water in the tropics and having the sun so much stronger. She also talked about using a hydration system - my 'hydration system' was going to be a water bottle but again, because you are out in hot, humid weather and are exercising, it's important to keep hydrated. The thing with hydration in an outrigger is sometimes the canoe flips over - this is called a 'huli' - and when that happens, everything tends to fall out of the boat. If your hydration system isn't attached to something, you now have salt water to drink - not a good option. I did come up with a fanny pack water system that should be good for the 2-hour paddling sessions, but am reminded that I still need to come up with a system for any long distance races I may go in this year. I have to go and try to find some comfortable, light long sleeve shirts and continue with my packing. It snowed all night again and is a grey day today - hopefully the packing will take me to a happier place! Ken found a good check list and I think we will have all that we need with us. 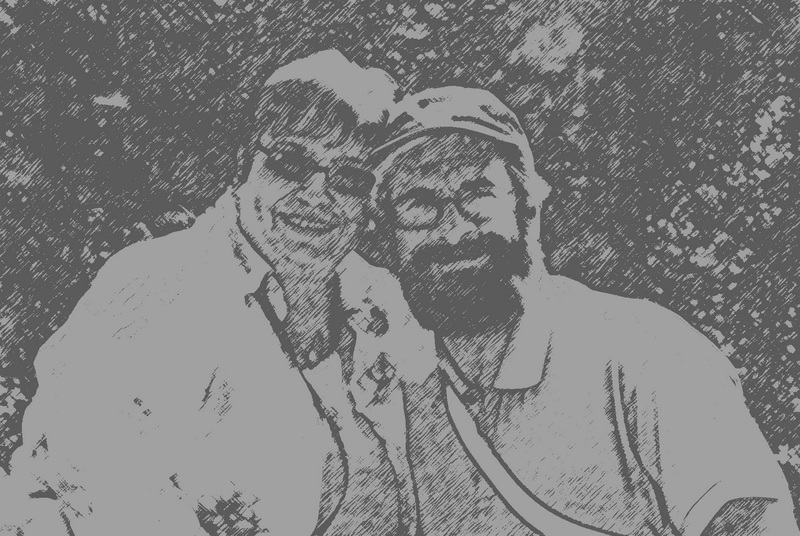 Reading thru it, he would go and get the things we had thought about but hadn't gathered up yet - very helpful. Things are moving from the to do list to being done - pick up from airport arranged, car rental arranged for later in the trip, got the directions to the second place we're staying at and as per my dentist's advice, remembering to ask for a lava flow drink when we arrive. Some deliciousness consisting of rum, coconut rum, crushed strawberries and bananas-mmmmmmmmm lava flow... I think I found my happier place! More snow today which is a good thing since we are planning to be on the beach in four days. Right? To me, this is the point of the year when you should be thinking “it’s pretty nice, but I may as well go see how things are in Paradise”. The problem is that I don’t have a lot of friends and my going to Hawaii could just drive the few friends that I do have away. Oh well, it isn’t like they are money friends, and they don’t have many friends either. I’ll pick up some crappy T-shirts and all should be fine. Well, I went out today and bought three very loud Hawaiian shirts and a pair of shorts that are so bright I can only use them for sleeping in, assuming I sleep with my sunglasses on. I tend to favour blues, browns, greys and whites when it comes to clothes. I have accepted the Hawaiian challenge and plan to look just as stupid as everyone else. Not much else to report except that in our insurance company’s eyes, Hawaii is not a part of the US of A. President Obama will be interested in hearing that. I guess there is no way to get around paying the rental company for liability insurance. Oh well, let the haemorrhage begin. I find that I am getting intrigued more than excited about the trip. What must it be like to live full time in paradise? Fun for a vacation perhaps, but whether it would be any different living here than anywhere else? I am not sure. I am going to make a point of talking to the locals and getting their take on life in paradise. Yes, I am aware of what the answer will more than likely be, but I still plan to reach out and touch the people. With any luck I will stay out of jail and get a little island insight. I will have to be careful, as these are the same people that performed human sacrifice and thought that clothing made of grass would be comfortable. On Thursday March 31 we will be standing and waving by the Duke Kahanamoku statue on Waikiki Beach from 3:00PM Hawaii time till about 3:10PM. That is 9:00 PM Ontario time; 7:00PM Alberta time and 6:00PM BC time. I have no idea what time it will be in Australia, Korea or Cambodia, you have to figure that out yourselves. I don't know how this is working for other people, but I have to cut and paste and then it works just fine. Despite the fact that Ken came up with the idea, I think it's pretty good. This way we can communicate without yelling, throwing the finger or other such immature behaviour that has happened from time to time. Everyone knows how tolerant I can be of other people's bad behavious - saint has been mentioned a few times - but I still welcome this opportunity to avoid conflict. Having this blog also gives us a way to communicate while we are on our trip instead of inundating everyone when we return. We will be in Hawaii March 30 - April 18 and are VERY excited. I don't know whether or not this is a good idea. Well, I am pretty sure it isn't as it was mine. The main reason is to try and keep a journal/diary of our trip to Hawaii. I am being pretty optomistic that there will be wifi where we are going, but that's me Mr. Positive. The nature of writing is a solitary one which is why I thought wouldn't it be great for two of us to have access to this. You should hear what Louise has called me already. Oh well, onwards and...well...that way. Ken set up this blog. How appropriate to call it Life in a Nutshell - since we are a couple of nuts and do feel shell shocked from time to time! The url is //happysquirrelcouple.blogspot.com - need I say more? What started out as a way to document our trip to Hawaii has become a daily routine for me now. Just observations about the world around me and the whack-a-doodles that inhabit said world. Read on, I hope that you enjoy and maybe get to laugh a bit.